Since all of you have liked the how to tutorials, i figured I hunt for more tutorial ideas other than the typical classics. 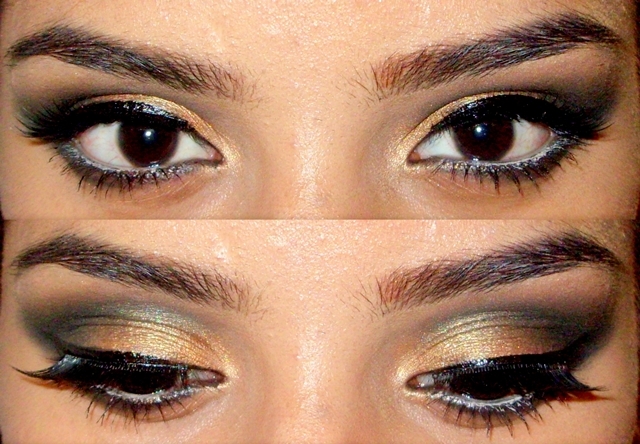 I figured the two colours gold and green complement each other extremely well and thus came up with this eye makeup tutorial! This tutorial requires a lot of blending so make sure you have a good fluffy blending brush. This would be something I would wear during the night because of its intensity. 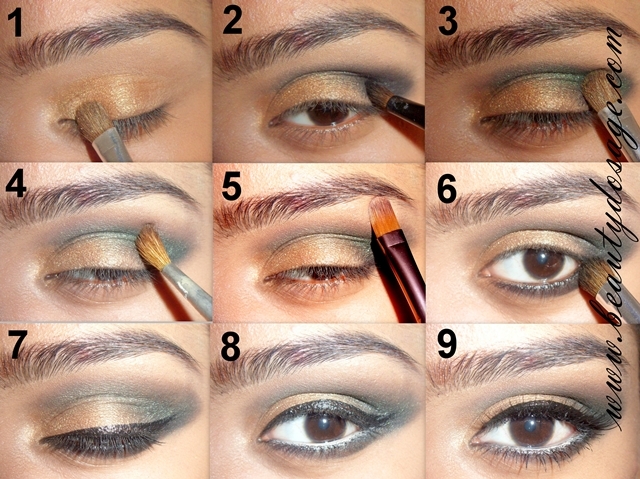 Prime your eye lids and apply a gold eye shadow from the inner corner until about the ¾ of the eyes. The reason i started with the lighter shade is because i will know exactly where to place the green later on as darker colours are harder to remove. Trace the outer V with a black cream shadow or gel liner and lend it with a black eye shadow. This will be a base for the green to appear deeper. Apply a dark green shadow all over the area the lack was applied and with he same brush move it, ack and forth between the gold and green this blends the shades effortlessly. Picking a chocolate brown shade, blend away the harsh edges. Have a light hand whenever your blending darker shades as they tend to spread out quickly! Using a shimmery champagne shade, highlight the brow bone and the inner corners of the eyes to bring a bright look to the eyes. Using the same black gel liner trace on the lower lash line starting thin in the inner corner and making it thicker at the ends and lend it with the same green shadow used above. Line the upper lash line with a lack liquid liner. I went for a winged liner without a long flick. Curl the lashes, add mascara and also apply falsies. As i always say a dramatic look is pulled together with false lashes so do try them! And that’s the finished look! Gold is basically my favourite shade of eye shadow! It goes well with my medium, warm toned skin. It looks lovely on tan beauties as well! I really love this look! It's versatile enough to be an everyday look OR you could wear it out at night. I love tutorials like this and look at them often because I run out of ideas for eye makeup and I hate wearing the same eye look day after day. Let me know if you'd like to follow each other, I really love your site! Lovely post! I know how much hard work it is to put a detailed post like this.. I love this look - I'm definitely going to try this!